Posted on 01 January 2014. Music is widely regarded as a universal language, and the same can be said about partner dance. Both enable members of diverse communities to connect and communicate effortlessly. Tango, born in the second half of the 1800s in the immigrant tenement communities of Buenos Aires and Montevideo, brought together former slaves and those who had come from all over Europe to Argentina looking for work. They were people from multiple cultures, who spoke many different languages and perhaps had nothing in common besides poverty and a passion for dancing and music. 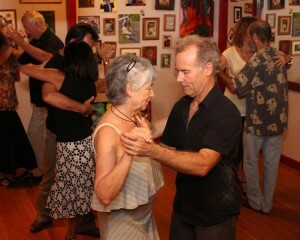 More than a century later, tango still brings people together – even on Kauaʻi, where tangueros, or tango dancers, travel from all over the world to dance with members of the Garden Isle’s unique tango community. 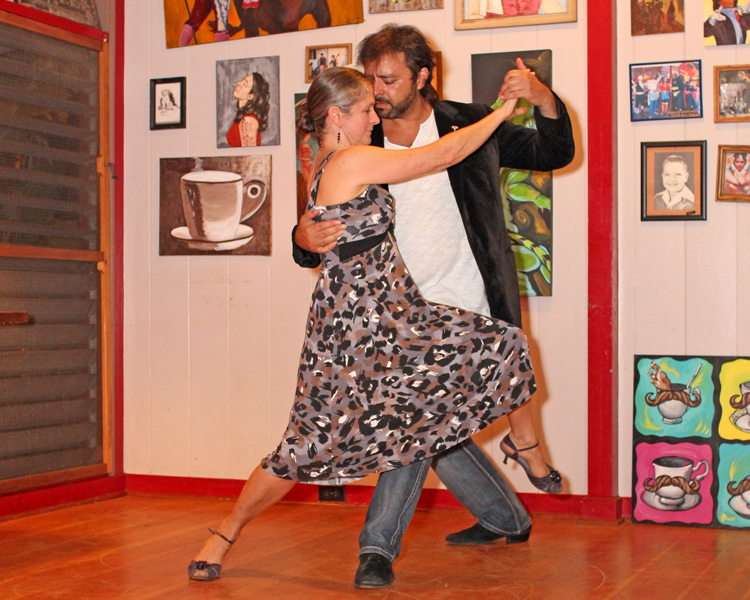 Maurizia Zanin and visiting tango dancer Gregory ‘Grisha’ Nisnevich warm um for a workshop at Small Town Coffee last December. 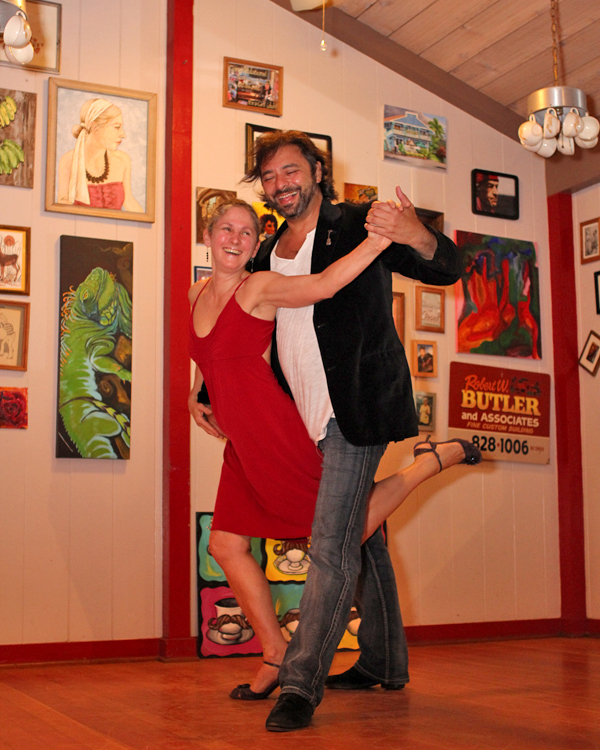 Maurizia Zanin’s passion for tango was ignited about 12 years ago, when she saw a couple visiting from San Francisco, Calif. dance tango at a ballroom workshop on Kauaʻi. The couple’s intense yet calm connection captivated Zanin. For the next two years, there were sporadic attempts to keep tango going here. 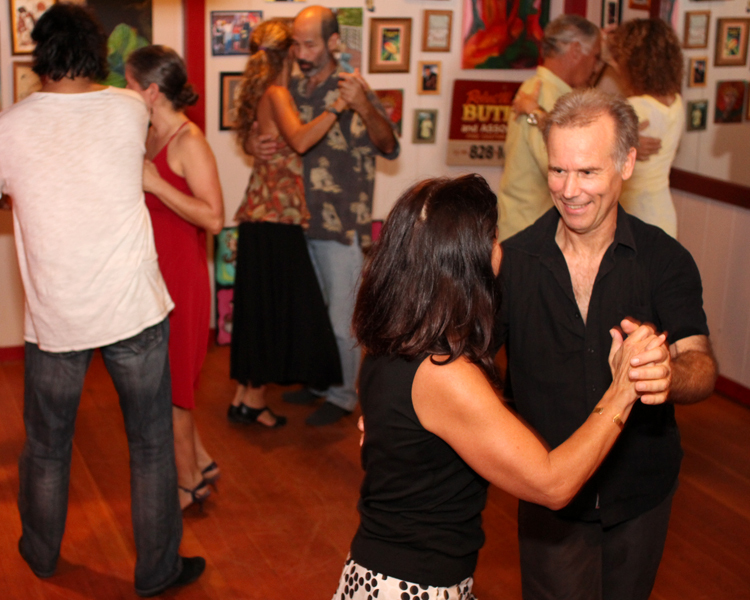 But it was only about 10 years ago that tango really put down roots on Kauaʻi, after Zanin and a friend formed Aloha Tango and began holding regular classes and events. Out of necessity, Zanin took the role of organizer – and later teacher – to be able to fuel her new passion and continue dancing tango. It didn’t matter who showed up, the small group just wanted to learn and dance, she said. After Zanin’s friend left Kauaʻi about eight years ago, Aloha Tango fizzled out and she put together Tango Kauaʻi, which involves several active members rather than just two people. 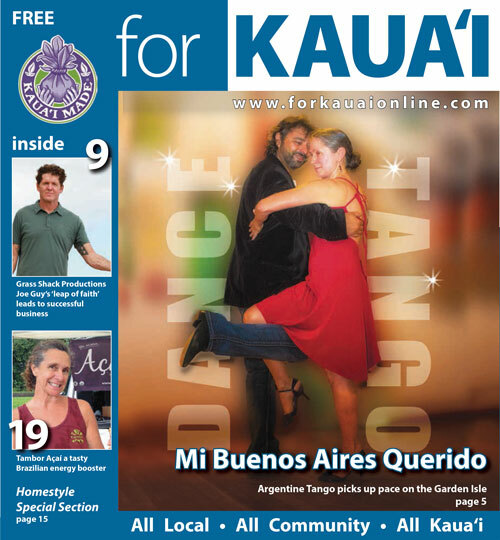 About two-and-a-half years ago, Tango Kauaʻi became a nonprofit, and the group gets together regularly for dinners, hikes and, of course, tango dancing. They also invite tango teachers to Kauaʻi, and most times offer them a place to stay. “I suddenly felt I could dance and I wanted to dance,” said the man who has a deep passion for arts and creativity. Nisnevich has been a professional dancer and teacher for several years. 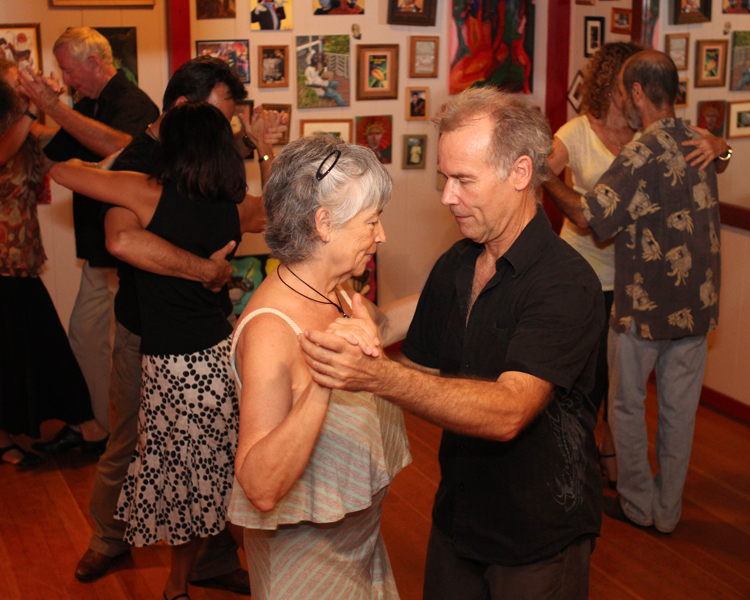 In December, he was on Kauaʻi for a concert and a few tango classes, which attracted dancers from all age groups and skills, united by one passion – tango. Risa Kaparo, a tanguera and former Kauaʻi resident who returns to the Garden Isle each year, uses tango in “embodied mindfulness” practice and emphasizes the learning and creative aspects in her annual Delicious Dance Workshops in Anahola. She said research shows partner dancing is better than any activity – including playing chess or learning another language – to prevent Alzheimer’s disease and other dementia. In fact, when tango’s popularity exploded in Europe in the beginning of last century, it became the first partner dance there to involve improvisation rather than pre-set dance steps and choreography – and improvisation is key in preserving the brain’s elasticity. Moment to moment the dancers must be completely present, attuned to their partner, the music, their body positioning, as well as the space around them as they maneuver among other couples on the dance floor. 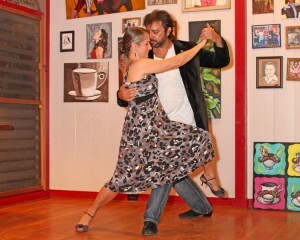 And as Zanin said, it doesn’t matter which language the dance partners speak, tango is how they communicate. Visit www.TangoKauai.com for more information. Donia Lilly is an artist, writer, designer and dancer on Kauaʻi. Her work can be seen at www.DoniaLilly.com or www.LaNomada.com.